What does Occupy Wall Street and the Arab Spring have in common? A lot more than you’d think. They’re disorganized. Unfocused. Kids who feel entitled. Where have we heard this from before? During the Arab Spring state government-run television sought to criminalize the youth who had taken to the streets in Tunisia, Egypt and Libya. They were portrayed as being rowdy youth who had been supposedly “Americanized” and “traitors” for protesting their government, as if they were disloyal members of society. The state-run media showed only the car burning, stone-throwing, petty violence of the Arab youth in hopes to destroy the entire image of the revolution. They were more engaged in rioting and bringing instability to the country instead of producing a real solution. Well, we all know now that, that wasn’t the real image of the Arab Spring. They were all united for a cause: To fight social injustice. The broad theme encompassed every issue that affected the lives of these Arab revolutionaries–soaring food prices, unemployment, corruption, etc. Together they united under this cause, and came up with a solution to end their problems: Change of government. In Tunisia this was to overthrow President Ben Ali, in Egypt Hosni Mubarak, and in Libya, Qaddafi. The youth around the U.S. are essentially protesting for the same reasons: Against social injustice, and for changes in government policy. There is no clear leader, but a mutual agreement to a solution. However, the protests have been especially receptive to criticism. From mainstream news stations calling the protests “disorganized” (CNN DISORGANIZED DEMO AGAINST CORPORATE GREED), to extreme commentators like Glenn Beck, who calls the protests “a shameless display of moral depravity” . There is a clear generation rift revealed by these protests, which anyone can notice by the disproportionate number of adults who denounce the protests as “youth having nothing better to do with their time”. One can look beyond their parents onto their own college campuses, where many of their fellow peers are disillusioned by the news into believing the protests serve no purpose, other than an excuse to get together and protest. Occupy Wall Street is our generation’s Woodstock. It’s our “March to Washington”. It’s our Arab Spring. The Arab youth protested for the same reasons. They faced high unemployment rate (over 20%) after graduating from college, which diminished their prospects of starting a family and living what was the average life of their parents’. They protested because they feared for their future and did not want to continue to sit by idly as it was being destroyed by their corrupt government. While the situation was worst in the North Africa and the Middle East (dictators, worst poverty and what not) it is nevertheless the same problem youth in the United States face today, and which is why, for the same reason, they are protesting now. While US media may be portraying the protest negatively, international media is not. The world itself has been heavily impacted by the influence of the top 1%, and of Wall Street over the government. The Arab revolutionaries and supporters understand youth, and labor movements protesting. 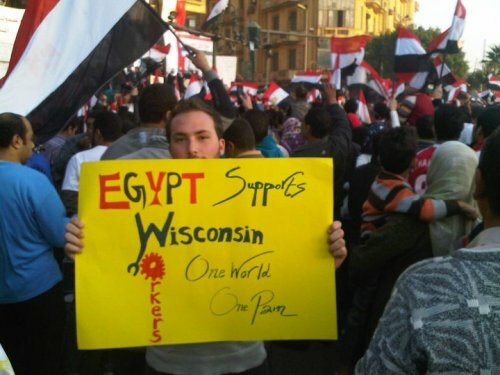 That is why during the Egypt uprising, you had demonstrators holding up signs in solidarity with the Wisconsin workers, and likewise. And which is why you have students in Palestine also doing the same. (If only more Americans showed the same support toward the Palestinians). Aside from the Arab Spring and Occupy Wall Street sharing the motivations, goals, and atmosphere of a youth movement, the Occupy Wall Street protests are also looking upon the Arab revolutions as a model to form their own around the country. The protests have adopted a, as Politico describes, an “online nature” of spreading the word and awareness through blogging, tweeting, and Facebook, the same as the Arab Spring. Occupy also faced unlawful censorship from the government–Occupy L.A. on Twitter was blocked temporarily because of orders on behalf of the Government, who wanted to prevent organization for a mass occupation in one of the largest cities in Los Angeles. One of the first days of the occupation was deemed, “the Day of Rage”, copying the Egyptian revolution’s own day of rage. 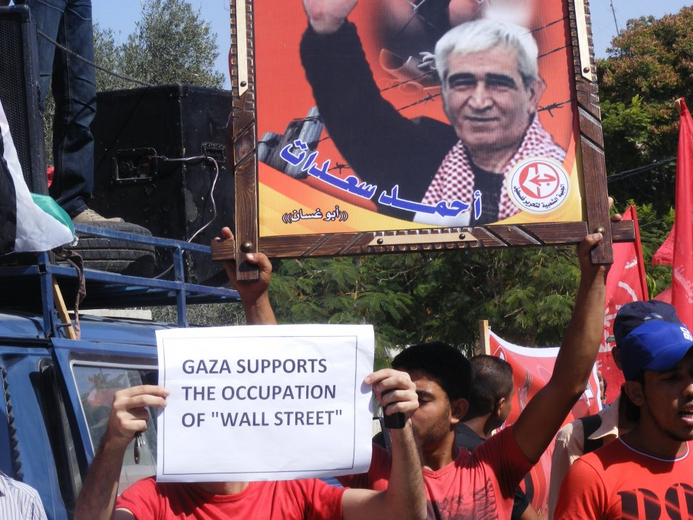 The main difference between the Arab Spring and Occupy Wall Street, is while most Americans agreed that the Arab revolutions were a good thing, they do not share the same consensus toward the Occupy protests around the country. This may be the result of the Right trying to portray them as being scary–the Central and Left conveying them as being unfocused, and disorganized. However, when people look beyond the news and talk to an “Occupier”, they begin to understand that the people protesting, these “Crazies” are the same as you and me. They are young students frustrated with the prospects of their future. They are waitresses and waiters not able to afford housing. Farmers not earning a livable wage. Laid off teachers, coming together to demand for the government to come to a solution to help improve the lives of the bottom 99%. 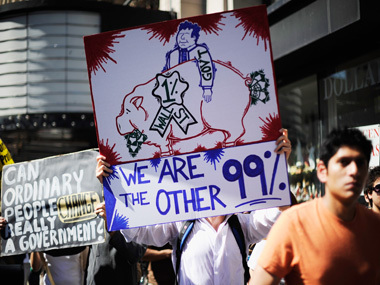 What these 99% have that the top 1% does not, is numbers, and that is what they are using to their advantage. The longer they occupy City Hall and Wall Street, the more time people have to see them, and the more obligated the government will have to address the issue. They have already tried– through violent crackdowns by police, which helps bring even more attention to the government. The longer they are there, the more time they have to recruit, and educate Americans on the importance of occupying their government to bring about change. Republican candidates, like Herman Caine may disregard the protesters by telling them to “get a job”–but it’s exactly comments like that, that have brought the masses of people to City Halls around the country and Wall Street. While the Occupy Wall Street protests may seem like it is not accomplishing much, it has the potential to shape the Presidential elections, when the 99% begin asking Presidential candidates like Herman Caine how exactly they can get a job. Tags: Middle-East Politics, Occupy Wall Street, OccupyWallStreet, politics, U.S.
After reading your thoughtful analysis I decided to investigate the demands which are taking shape online at http://coupmedia.org/. After reading through all of the recommendations, I engaged by taking part in the online voting process. I suspect that most citizens would discover that they support at least a few of the demands. As with most initiatives, it appears that several unrelated demands are sneaking their way in. As Moira Forbes suggests, a narrower focus would be much more effective at this early stage http://goo.gl/kHQGJ. Even though the protesters may not understand, or clearly articulate each point, they are at least disrupting complacency. Thank you for challenging the status quo.